SEO stands for search engine optimization. 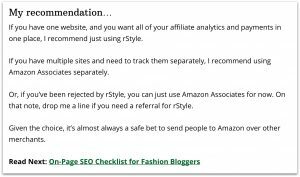 Most fashion blogs I come across don’t understand the basics of SEO for bloggers, so they miss out on tons of organic traffic. The sad thing is, their content is awesome. But it’s not optimized for search, so they aren’t “ranking” highly in search engines. 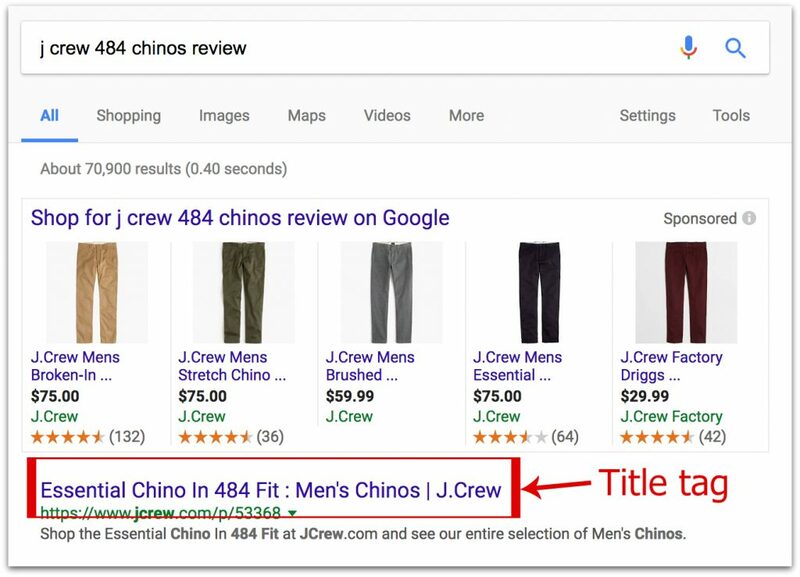 In other words, when people use Google or other search engines to search for content, you want your content to appear on search engine results pages (SERPs) – rather than someone else’s content. Over at The Modest Man, most of my traffic comes from search engines. At the time of writing, TMM has gotten 119,444 organic visits in past 30 days. If you’re not getting this kind of organic traffic, I want to help. Specifically, I want to help you understand SEO and use basic SEO best practices whenever you create a new blog post. It’s not very hard to optimize your content for search engines. It comes down to a handful of very basic, very easy-to-implement factors. And that’s what this post is all about. 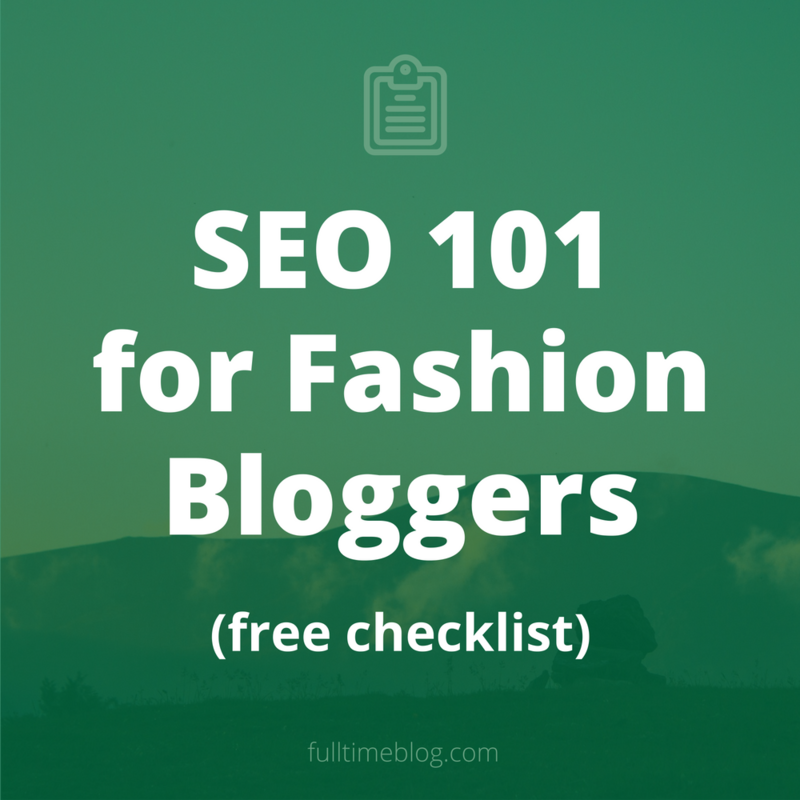 I’m going to teach you the basics of on-page SEO for fashion bloggers (or any type of blogger, for that matter). This entire process takes about 15 minutes, so there’s no reason not to do it before you hit “publish”. Other than creating your own links (from one page on your site to another page on your site), you can’t really control backlinks. Sure, you can ask people to link to your blog posts, and you can hope that other sites love your content enough to link to it. But, in general, link building takes a lot of effort, and you don’t really have direct control over it. So we’re not going to focus on that right now. Instead, we’re focusing on the second major part of SEO for bloggers, which is on-page SEO. These eight elements are very easy to manipulate, and they’re crucial for any blogger who wants to get the organic traffic they deserve. I want to go over each element in more detail, but first we have to talk about keywords and keyword research. We’re talking about the “keywords” field you see in your blog post editor. That field is outdated, and you shouldn’t use it (it doesn’t help, and it might even hurt your rankings). We’re talking about search terms – the words people type into search engines like Google. These are all keywords (which can be one or more words). In general, longer phrases are less competitive. In other words, it’s going to very difficult for your content to be found when someone searches for “jeans”. But a longer, less popular, more specific search term like “jeans for short men” will be much less competitive. Assuming your post is properly optimized, you could definitely rank for that term and get some targeted organic traffic. You should do a little bit of keyword research every time you sit down to write a blog post. I’ll show you how to do it in about five minutes. Every time someone uses Google to search for something, Google records this data. So they know exactly what people are looking for (to the word) AND how often they’re looking for it. Here’s the crazy part: they make this data available to the public, for free. Why would they do this, you ask? Good questions. Google makes most of its money from ads. You know those little ads at the top of the page when you search for something? Yeah, that’s why Google is such a gigantic company. No surprise here, right? But, in order for advertisers to figure out when they want their ads to show up (and how much they’re willing to pay for those impressions), they need to know what people are search for and how often they’re searching. 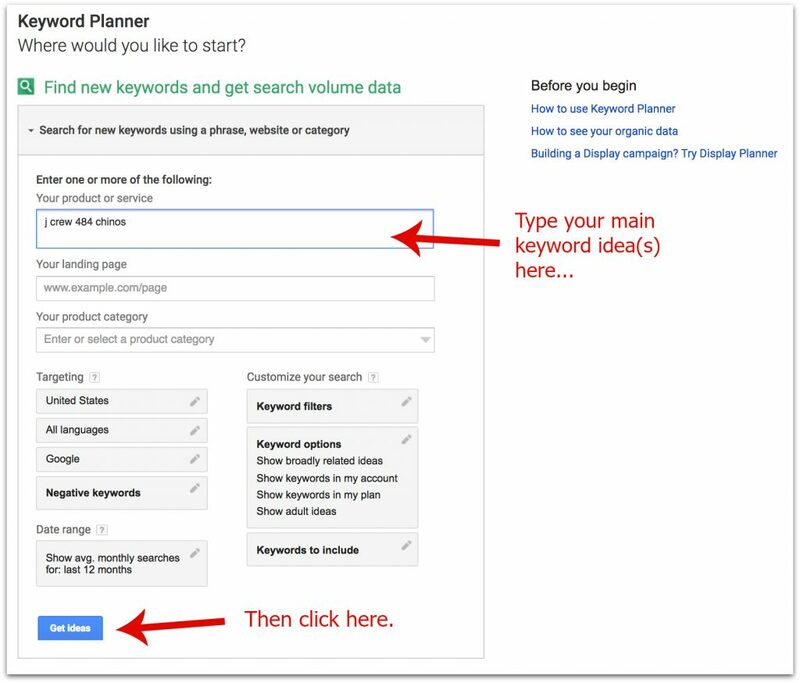 So, Google created a tool called the Keyword Planner to help advertisers figure out which search terms (keywords) to bid on. But you can use this tool even if you never plan on buying ads. 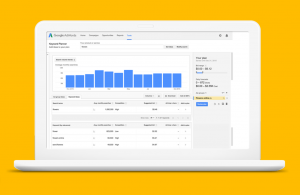 You just need a free Google Adwords account, which you can sign up for right now using your existing Google (or Gmail) account. 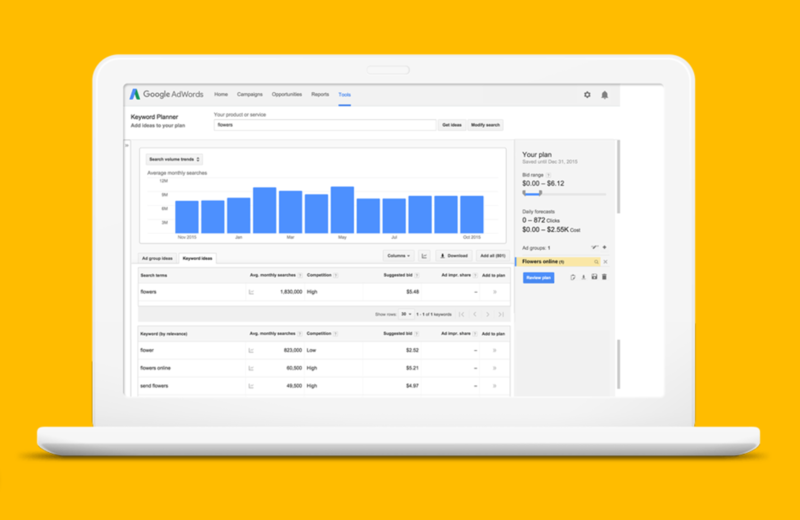 If you don’t already have an Adwords account, go ahead and sign up now so you can follow the rest of this tutorial. Enter the main term or phrase that your blog post is about, such as “skin care” or “j crew jeans”, then click ” the Get Ideas button. 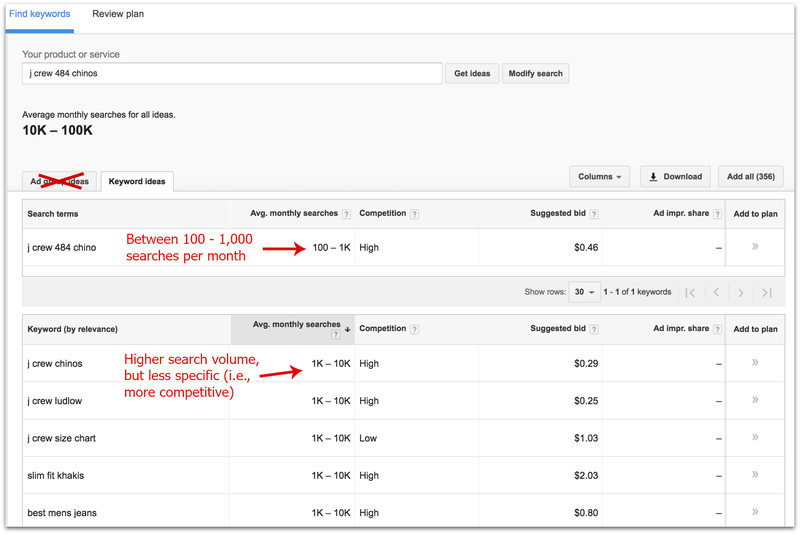 Does your target keyword have decent monthly search volume (over 100)? Are there variations of your keyword that you haven’t considered (for example, “jeans” versus “denim”)? Do you see any alternative keywords that might be better (more volume OR less competitive)? If your target keyword has very little search volume, it might not be the best search term to target. If there’s a variation or alternative with higher search volume that pretty much means the same thing, go with that instead. If you target keyword has very high search volume (over 10k), it is going to be very competitive and hard to rank for. Try to make it more specific (i.e., less competitive). For example, “j crew chinos” is more general (i.e., competitive) than “j crew 484 chinos”. 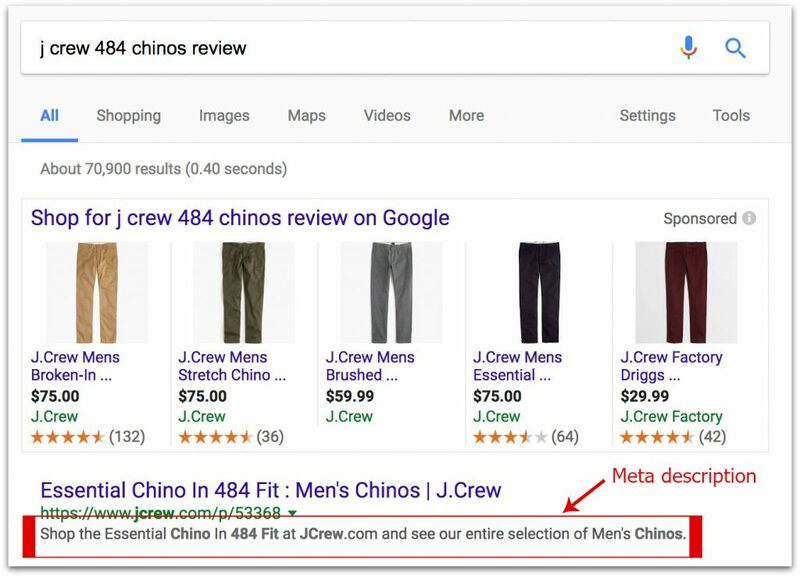 Now that you’ve identified your keywords (try to target one main keyword and 2-3 variations), it’s time to use them for your on-page SEO elements. From as on-page SEO perspective, this is the most important element of your post. It’s your chance to tell search engines what this post is all about. Of course, you also want to make the title catchy and enticing. When in doubt, write for humans, not search engines. But you can usually do both! The URL is also important. It should be short (2-5 words) and to the point – no filler words – and it should contain your main keyword. Also, if you don’t have your site set up to display URLs like this one, you should change your permalink settings (in WordPress, go to Settings > Permalinks). Most blogs don’t need any numbers, symbols or subdirectories in your URLs (just yoursite.com/post-title). Your keyword(s) need to appear throughout the content on your page (the post). This should happen naturally, but you want to make sure it’s in there a few times. It’s especially important to make sure your keyword is in the first sentence or paragraph of the post. Most blogging platforms let you use different text style, including section “headers”, which are typically bigger and bolder than regular paragraph text. The text above is an example of a section header. It’s a good idea to use section headers and include your keyword in them. These are also great for readability, as they help your readers scan through the content and figure out what they want to read (most people don’t read the whole post top to bottom). Alt text is an “attribute” that every image on your page should have. People who are vision impaired will use screen readers to browse the web. Basically, software like Siri will read a webpage to them. Obviously, this software would have trouble describing images on a page. That’s where alt text comes in. It’s a field that you can use to tell screen readers (and search engines) what your image is. So it’s important for usability, which is why it’s included in Google’s algorithm. Your alt text should be as descriptive as possible. Nothing fancy or elaborate, just a description of what the image is. Bonus points if you can include your keywords in the alt text of at least one image on the page. The title tag is invisible to readers. It’s a little snippet of code that search engines use to figure out how to display your page on SERPs. Some blogging platforms have a title tag field built in. For example, the WordPress theme I use was built by people who understand SEO, so it has this field built in. 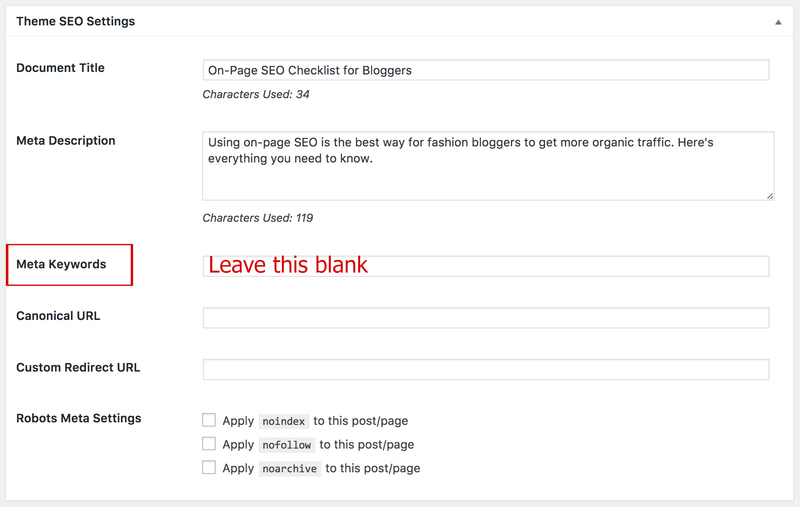 If you don’t see this field in your post editor, use a plugin like All in One SEO Pack (it’s free). Again, your theme might have this built in, or you can use a free plugin to add the functionality to your site. Google sees the Internet as one big popularity contest. The more links a website has pointing to it, the more popular it is. Therefore, websites with lots of backlinks rank much higher in search and get more organic traffic. While it’s pretty tough to get other websites to link to you, you can create your own links very easily. So, whenever you write a new post, go back to one of your old posts (preferably a related post) and create a link to the new one. For example, I just created a link to this post (the one you’re reading) on the Resources page. So when this post went live, it already had one backlink. Pretty cool! I recommend doing the above process for every single blog post, including older ones that you’ve already published (especially the longer, more in -depth posts). To make things easy, you can bookmark this guide/checklist and come back to it when you’re working on a post. I promise that the extra effort is with it. You won’t see immediate results, but if you make sure to do proper on-page SEO for every post, you should start to get more organic traffic over time. This is an awesome primer for newbies. Thanks so much. I run an ecommerce store with many product lines but have been intimidated to set up a blog. Now I see it’s possible without too much stress. 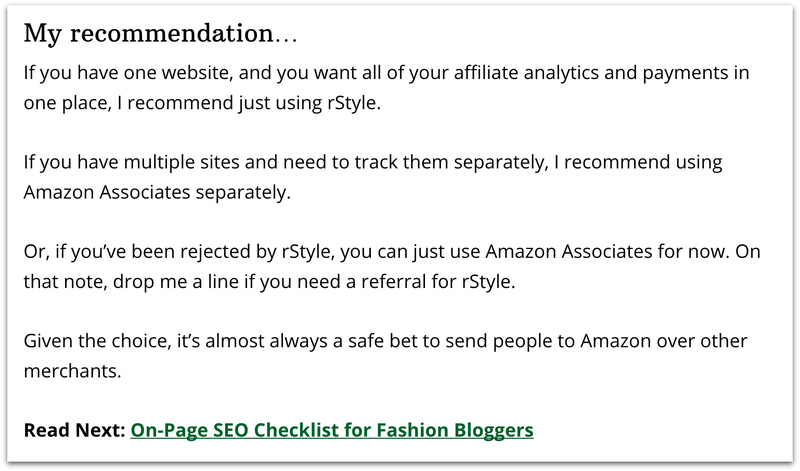 Thanks for making a really easy to read and use checklist for basic SEO. I just started using some of your tips on my website. Hopefully I’ll start to get more traffic! Thank you for sharing this! I found this super easy to follow, and hope I will see results from doing this. This post only talked about on-page SEO, but I am wondering how you can rank the overall site high for ‘style tips for short men’. Can you please write a post on that? You mentioned that you didn’t do anything specific for branding, but I feel that all your posts are very cohesive and around dressing well for short men! Thank you so much for this article! Do you have any keyword suggestions for more autobiographical blog posts such as about your chilhood, etc? Thanks Brock by far the best speaker I met at stylecon and best guidance . Thanks for the really useful (screenshots help a ton) guide. I wish I would have found this earlier in my journey.